Each boasting pure design and uninterrupted lines, there are 43 rooms that each reconcilie comfort and technology, including a suite with private jacuzzi and its own terrace, 2 new «IBIZA» style suites, offering private gardens and their own bioclimatic pergola exclusive private pool access. 27 rooms spread among 5 villas all made from raw and natural materials, and including a privatisable villa that faces the sea, perfectly aligned with its kitchen view, eating room, and two living rooms. 65 sqm with a terrace of 30 sqm including a heated SPA. This suite is located at the last floor of the resort and includes a panoramic view over the sea. The Kube Suite provides the latest in-room equipments and technologies in tems of light system and includes a flat screen TV with national and international channels, free VOD and a coffee machine. With almost 40 sqm : the Prestige rooms can benefit, depending on their location, from a private bacony, a garden view or a sea view. They include a flat screen TV, free VOD, coffee machine... They can be connected and equipped with a hammam. KLUB rooms, with 30 sqm, are divided into 5 villas. Natural, raw materials such as wood contrast with KØØL rooms. Smart TV, free VOD , international plugs, USB plugs ... the technology knows how to become useful so that you feel at home. 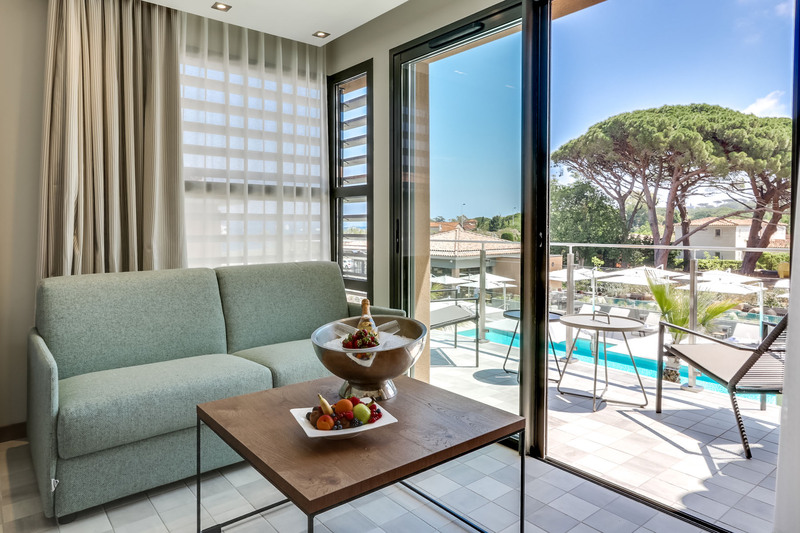 With an area of more than 30 sqm, the superior rooms of the Kube Hotel Saint-Tropez have, according to their orientation, a sea view, a pool view or a garden view and are equipped with flat screen TV including national and international channels and free VOD. With an area of more than 25 sqm, with a pool view, a sea view or a garden view, the classic rooms of the Kube Hotel Saint-Tropez are equipped with flat screen TV including national and international channels and free VOD.